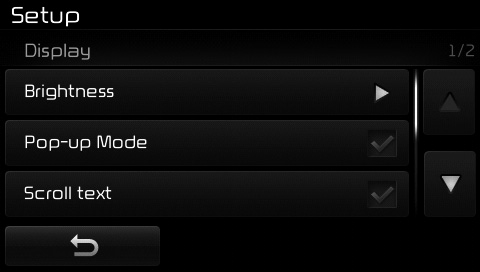 Use the , buttons to adjust the screen brightness or set the Brightness on Automatic, Day, or Night mode. Press the button to reset. 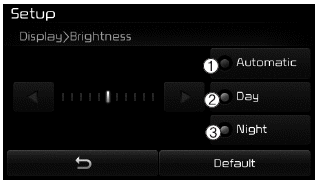 This feature is used to display the Pop-up Mode screen when entering radio and media modes. When this feature is turned on, pressing the or key will display the Pop-up Mode screen. The media Pop-up Mode screen can be displayed only when two or more media modes have been connected. This feature is used to scroll text displayed on the screen when it is too long to be displayed at once. When turned on, the text is repeatedly scrolled. When turned off, the text is scrolled just once. 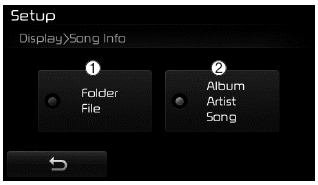 This feature is used to change the information displayed within USB and MP3 CD modes.